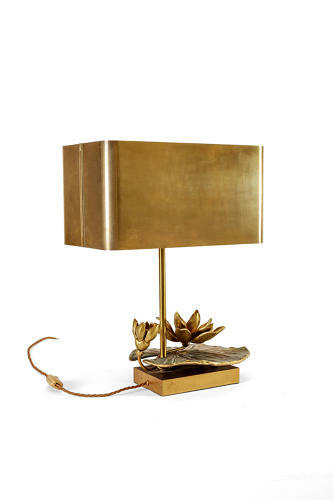 Maison Charles water lily lamp, circa 1970. The pinnacle of French post war design and production. The business was founded in 1908 and is still producing today. Gilt and painted bronze leaf and flower. Brass base and lampshade. 2 bulbholders. Certified and rewired. The lily leaf measures 27 cm by 20 cm. The lampshade measures 35 cm wide, by 19 cm high and 21 cm deep.